These healthy recipes are all created to pair with wine (a 5-ounce glass has anywhere from 110 to 150 calories)—all for 600 calories or fewer. 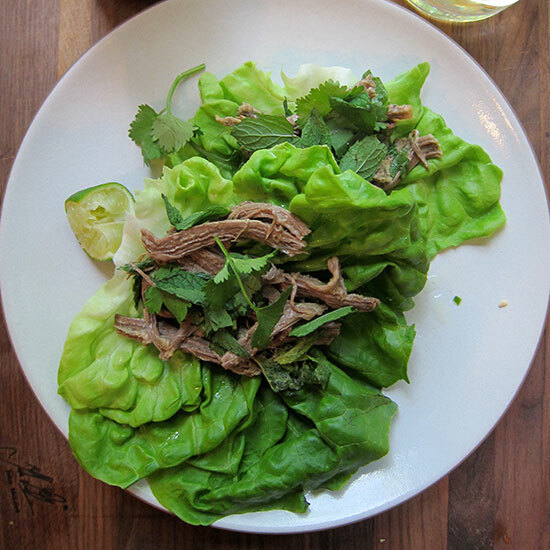 The meat is not meltingly tender; rather it has a pleasant chew and is delicious with fragrant herbs and a bright lime dressing. This is one of the rare beef dishes that pairs beautifully with white wine, especially off-dry Rieslings. 1. COOK THE STEAK In a large pot, combine all of the ingredients and cover the steak by at least 2 inches with water. Bring to a boil, then simmer over moderately low heat, skimming off any foam, until the beef pulls apart easily with a fork, about 40 minutes. Remove the pan from the heat and let the beef cool to room temperature in the cooking liquid. 2. Transfer the steak to a large bowl, and using two forks, finely shred the meat, discarding any fat. Add 1/2 cup of the cooking liquid to the beef, season with salt and let stand for 5 minutes. Strain the remaining cooking liquid and refrigerate for another use. 3. PREPARE THE SALAD In a small bowl, whisk the 1 tablespoon of lime juice with the fish sauce, hoisin sauce and the 1/2 teaspoon Sriracha. Pour the dressing over the beef and toss. Season with salt and add the scallions, the 1/2 cup cilantro and the 1/2 cup of the mint to the salad and gently toss. 4. Serve the beef salad in lettuce cups, passing lime wedges and more Sriracha, mint and cilantro at the table. Wine A bright limey, lightly sweet Riesling, like J.J. Prüm Kabinett. One Serving (without rice) 283 cal, 13.6 gm fat, 6 gm sat fat, 3 gm carb, 1 gm fiber, 37 gm protein.